The KMI investment has hit a rough patch right along with the entire midstream infrastructure sector. The share price decline in KMI is disappointing and causes investors to wonder if we missed something. We did a thesis [Source], analyzed the data and came to the conclusion that KMI has the potential for a good risk adjusted return over a three to five-year period. The reason we do a thesis and use the three to five year investment time horizon is for times like this. During periods of uncertainty our first question should be is the investment thesis still valid? Value investing is about finding opportunities the market may be missing, so we are often going against the prevailing market sentiment. However, recognizing we are often contrarian also requires us to demonstrate why we think the market is likely wrong. If we can, then we may have the opportunity for good gains. But things change or if we missed something we need to know that too, so we can take corrective action if needed. Let’s try to sort this out for KMI in light of the share price decline and re-examine our thesis including: the environment the company is in, the company’s underlying business prospects and the range of likely outcomes. That is the purpose of this post. The bear market in the oil and gas (energy) sector started mid 2014 and was already underway when we purchased KMI in November, 2014. It is continuing with oil prices down over 50% and natural gas recently hitting $2 per million Btu. Midstream infrastructure companies transport products under longer term, fee based contracts and are largely insulated from commodity price exposure. Further, the relative inelastic demand for energy supports the volume for midstream operations at almost any commodity price. At KMI for example 87% of the underlying cash flows are supported by fees and 96% supported by fees and hedges. Although the midstream cash flows are relatively insulated, the share prices are not immune from oil and gas commodity price markets and sentiment. The Alerian MLP Index is the leading measure of the price performance of midstream companies. 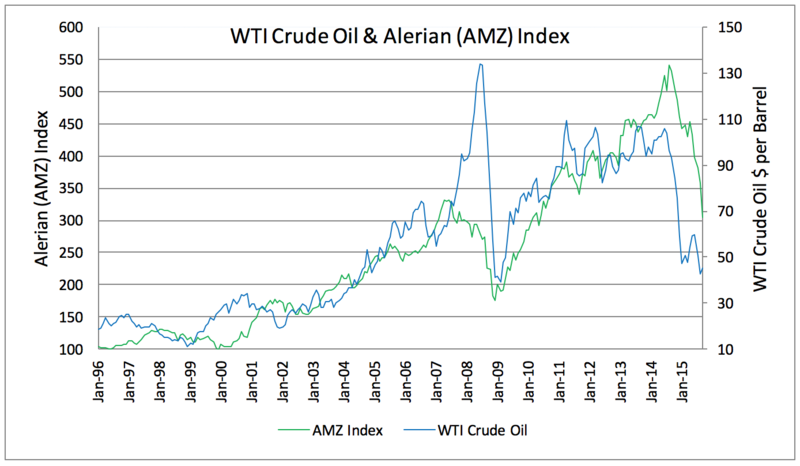 The graph below shows the Alerian Index and WTI crude oil price over the past 20 years and how midstream companies’ share and unit prices as measured by the Alerian Index tend to follow commodity price changes. Insulated underlying cash flows does not mean the share or unit price are immune from negative energy market sentiment. The following table shows the cyclical nature of midstream companies as measured by the Alerian Index. The current peak to trough decline has been about about 45%. A key tenet of value investing is not to think of stock as a ticker symbol with a quoted price; but as a certificate of ownership interest in the underlying business, a business with a value that does not depend on the share price at any given moment. Crude oil is down more than 50% from its cycle peak, the Alerian Index is down 45% since its cycle peak and KMI’s stock price has declined about 28% over the same period. Consider KMI’s trailing twelve months (TTM) operating cash flow declined from $4779 million 3Q14 to $4482 million for the TTM ending 3Q15 or about 6%. Those differences illustrate the disconnect between its share price and the underlying stable cash flows and more of a connect with the market. KMI is a major midstream player with a protective moat in an industry forecasted to almost double in size over the next ten years. As we experience another cycle of unknown duration in the energy sector, some question the anticipated midstream build out North America over the next 10 years and in turn KMI’s growth prospects. Thats why we use a 3-5 year investment time horizon, to give our investments enough time to come to fruition. Electric Generation: According to the Energy Information Agency (EIA), electric generation in 2015 is 32% gas and 33% coal. The EIA projects the mix of [power] generation in 2025 will be 39% gas and 18% coal. At Kinder Morgan the gas transportation volumes for electric generation is up 18% year-to-date 2015 vs 2014. Nationally 3Q15 shows a 4.4 Bcf a day increase from the 3Q14. Wood Mackenzie [Source] projects 8.6 Bcf a day growth in electric generation load from 15 Bcf to 25 Bcf. Renewables get a lot of attention and they should but they’re small and less reliable. Wind and solar combined generated less than 5% of total U.S. generating load in 2014. And indicative of the lack of reliability 2014 capacity utilization for wind was 34% and solar 28%. Reliable and flexible natural gas facilities are absolutely necessary. Adding to the demand picture is the retirement of coal plants due to environmental regulations and nuclear fueled instruments due to age and operational issues. Together there is a very bullish growth outlook for natural gas and electric generation. Natural gas exports to Mexico: It’s real and growing. Natural gas exports to Mexico for 2015 are expected to average 2.6 Bcf a day versus a 2014 average of 1.8 Bcf a day. That’s an increase of 44%. This summer natural gas exports at times exceeded 3 Bcf a day. Over the next four years, Mexico is expected to add 10.5 gigawatts of new natural gas electric generating capacity and another 3.2 gigawatts of oil power capacity will convert to natural gas. LNG imports to Mexico are on the decline and are expected to be completely phased out by 2023. These factors support projections that by 2025 natural gas exports to Mexico are expected to increase from the already elevated levels of 2015 by almost 3 Bcf a day. Build-out of US industrial and petrochemical facilities: The American Chemistry Council now counts 243 projects with a cumulative investment of $147 billion for the years 2010 to 2023. Texas alone accounts for 99 of those projects with the total value of over $48 billion, most of those are in Southeast Texas, the sweet spot [of KMI’s] natural gas facilities including Houston Corpus Christi and Beaumont. Global chemical demand is expected to double from 2000 to 2040. Wood Mackenzie estimates that over 2.5 Bcf a day of additional natural gas will be required by 2018 from 2015 levels to meet industrial demand driven by methanol fertilizer and petrochemical projects. Liquefied Natural Gas (LNG) exports: The Federal Energy Regulatory Commission (FERC) approved LNG export projects with 10.6 Bcf a day of capacity. By year end 2015 the Sabine Pass Train 1 will be in service with 650 million cubic feet a day of capacity. By next year with Sabine Pass Trains 1 through 3 online LNG capacity will be 1.95 Bcf a day. By 2019 U.S. LNG export capacity will be 8.97 Bcf a day only counting FERC approved projects which have achieved a final investment decision. KMI reported their third quarter (3Q15) results [Source] that were pretty much in line. They also announced two actions to address near term funding. Kinder Morgan increased the quarterly dividend to $0.51/share, up 16% and on track to meet its full year target of $2.00 per share with and estimated $300 million in excess cash coverage. The backlog of attractive growth projects decreased by about $700 million but remains strong at $21.3 billion. The company scaled back the expected dividend increase for 2016 from the 10% prior guidance (built into our investment thesis) to a range of 6% to 10%. This will provide the flexibility to meet the dividend with excess cash coverage. Subsequent to the 3Q15 report the company announced a mandatory convertible preferred share offering with a 9.75% dividend to meet $1.6 Billion in funding needs through the first half of 2016. The market reacted unfavorably to this offering; more on this later. Prior to the 3Q15 report the company announced [Source] Kinder Morgan announced it finalized agreements with BP Products North America Inc. to acquire 15 refined products terminals and associated infrastructure in the U.S. in a transaction valued at approximately $350 million. The key benefits of Kinder Morgan’s consolidation of its subsidiaries was simplifying the complicated ownership structure, lowering the cost of equity capital, and increasing the dividend for shareholders. The lower cost of capital and simplified structure would position KMI to take advantage of their scale and to participate more fully in the midstream infrastructure build out needed in North America. To accomplish this the company took on more debt and increased its leverage close to the limits of their investment grade credit rating. The industry downturn has depressed equity prices which at a given distribution payout makes equity financing more expensive right at the time KMI’s debt financing was stretched for the consolidation. The company reduced dividend growth guidance and has been cutting back expenditure in the non-core oil and gas production segment. Until KMI’s share price recovers equity will remain expensive and borrowing capacity limited at a time acquisition bargains are likely to occur. Still KMI’s backlog of attractive growth projects remains strong at about $21.3 billion. Measures taken to lower the cost of equity ended up increasing the cost due to concerns over increased leverage and the industry downturn. Prior to the share price decline for example, the company could issue stock at about $40/share so with $2.00/share dividend the cost of equity was 5% ($2.00/$40.00). At the current price of about $27.50/share the cost of equity increased to 7.3% ($2.00/$27.50). These challenges led KMI to arrange alternative financing to avoid the issue of undervalued common equity. Raising $1.6 billion with equity selling around $27.50/share would require the issue of 58 million shares of common stock compared to about 40 million shares at $40/share or 45% more shares. 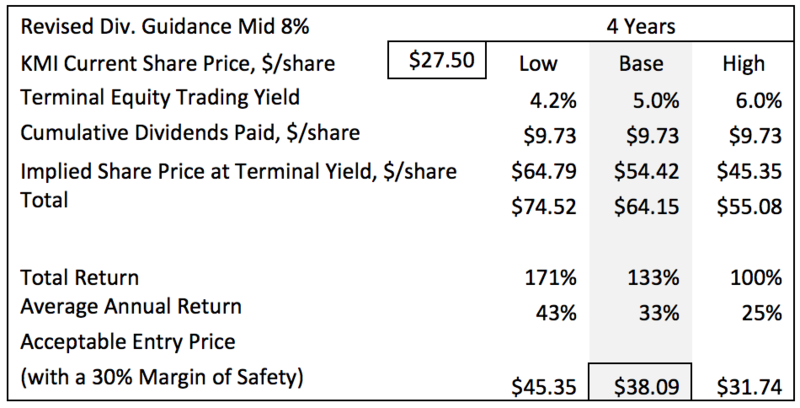 If KMI’s intrinsic value is about $40/share as we think it is, then for each $1.00 in common stock issued KMI receives only $0.69 in return at today’s depressed price ($27.50/$40.00 = 0.69). The preferred shares will pay a 9.75% dividend until they convert into common stock in three years. Investors require the higher payout (9.75%) on the preferred (vs. common shares at 7.3%) because the preferred shares are convertible to common shares in a range that limits the preferred share holders upside. If the KMI common share price improves within three years, as we think it will, then the preferred share issue is beneficial to the existing shareholders because of lower dilution at a marginal cost difference. In the KMI’s investment thesis a total potential return is estimated on the dividend payout and growth in share price resulting from the dividend growth guidance. Share price appreciation is based on an assumed terminal yield for the dividend. We lowered the dividend growth rate to the mid range of managements revised estimate (8%) and raised the terminal yield to 5% to reflect increased industry uncertainty. The table below show the potential results over a four-year investment horizon to be somewhat comparative to our original five-year outlook about a year ago. Although the energy bear market has reduced the potential returns, they remain very attractive for the patient investor. KMI has the potential for an estimated $54 share price and adding in the additional $9.73/share dividend to be collected over the next four years resulting in a potential 33%/year total return going forward. 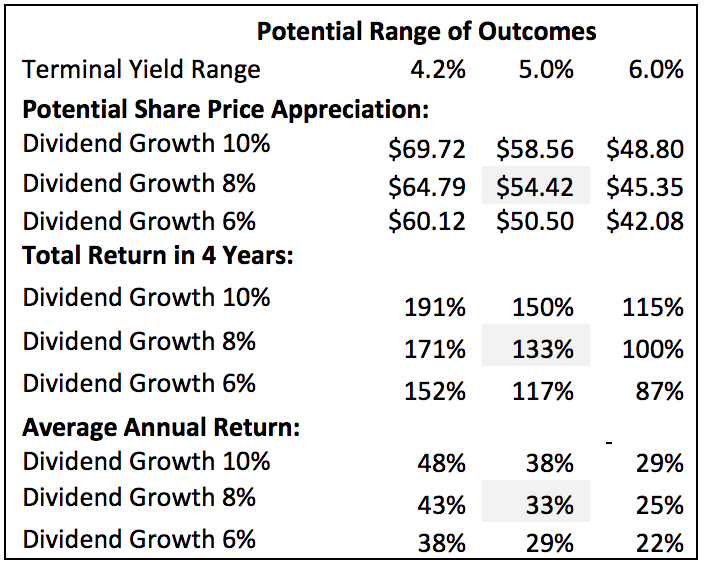 The table below shows the potential range of outcomes using the full range of the revised dividend growth guidance of 6-10%. Share price appreciation is based on an assumed terminal yield for the ranging from 4.2% to 6.0%. Within these ranges the company appears attractive assuming todays share price of about $27.50. Crude oil is down more than 50% from its cycle peak, the Alerian Index is down 45% since its peak cycle and KMI’s stock price has declined about 28% over the same period. Consider KMI’s trailing twelve months (TTM) operating cash flow declined from $4779 million 3Q14 to $4482 million for the TTM ending 3Q15 or about 6% reflecting the disconnect between its share price and the underlying stable cash flows of KMI’s business. You should do business with Mr. Market only to the extent that it serves your interests. Mr. Market’s job is to provide you with prices; your job is to decide whether it is to your advantage to act on them. Management believes the stock is undervalued, as we do, accordingly they announced KMI would not issue common equity through 2Q16. Management believes investors are placing a higher importance on dividend stability than growth and accordingly lowered dividend growth guidance to 6-10%. The company believes it could pay out 10% but would have limited coverage implying less stability to investors. KMI’s consolidation elevated leverage compared to peers (5.6x versus peer average of 4.0x). KMI has maintained its investment grade credit rating but the elevated leverage has elevated risk. The company intends to reduce leverage to 5.0x or less over the long term through increased cash flow as large scale projects underway come into service. Kinder Morgan share price decline is disappointing but not reflective of the underlying business strength. The adjusted valuation and prospects remain attractive. With a dividend yield near 7.5% and growing; we are well paid to be patient. You are encouraged to do your own independent research (due diligence) on any idea discussed here because it could be wrong. This is not an invitation to buy or sell any particular security and at best it is an educated guess as to what a security or the markets may do. This is not intended as investment advice; it is just an opinion. Consult a reputable professional to get personal advice that meets your specialized needs of which that the author has no knowledge. This communication does not provide complete information regarding its subject matter, and no investor should take any investment action based on this information. Hi – given the cut in dividend, is it perhaps more appropriate to do the valuation first on a cash flow basis (i.e. looking at what cash they generate, then how much they use to pay down debt, how much goes to new growth) and then perhaps value it on a multiple to cash flow or EV before considering your third method, dividend yield (and how the dividend might/might not grow)? Thanks. Good point, Sunrider; The last valuation was done when KMI was still holding to the former dividend policy. Under the revised dividend policy and internally generated cash flow funding, a cash flow valuation method is more appropriate. I’ll update the valuation when time permits.